Could this summer be any worse? Thirteen-year-old Amy's dreamy boyfriend, Seth, is off to Rome, while she gets to spend two weeks on a tiny Irish island with a nagging mom and a neurotic aunt locked in a feud, not to mention a crazy stepdad and a surly cousin. Good thing Clover, teen advice columnist supreme, is there to keep Amy from going completely nuts! 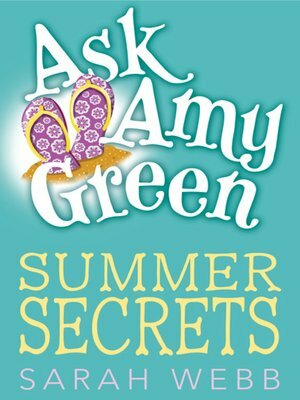 It doesn't help Amy's changeable mood that Seth keeps mentioning some girl in his e-mails, or that Amy feels an electric attraction to the mysterious young gardener next door. So when The Goss magazine unexpectedly sends Clover to glitzy Miami to write a revealing piece on a hot young actor (with Amy as her sidekick, of course) it couldn't come at a better time. U.S. of A-mazing- here they come! Sarah Webb is the author of Ask Amy Green: Boy Trouble, her debut novel for young readers. She has also written several novels for adults. She lives in Dublin, Ireland.